Tavern Toncic Zrenj is, well, the tavern I waited the longest to get in. Seriously, I heard about this place within my first month in Istria. Yet, I get to try it out almost nine years later. Another place it took me ages to try out is a tavern Batelina in Banjole. The two are very different, yet have few similarities. Tavern Batelina is the best seafood restaurant in Istria. Tavern Toncic Zrenj is a rural house offering hearty, meat dishes. Tavern Batelina is located in Banjole, a small seaside town near Pula. Tavern Toncic Zrenj is located high up in the hills, in Istrian countryside. Yet both places serve only what they grow (or catch). And both places are so busy that you need to make a reservation well in advance to get in. I am mentioning the both here, 'cause this week I finally got to try them both. Yay for me! Tavern Toncic is located in a small village Zrenj. You don't just happen to pass through Zrenj. You go there with an intention. Or in my case with a mission to finally see what tavern Toncic has to offer. 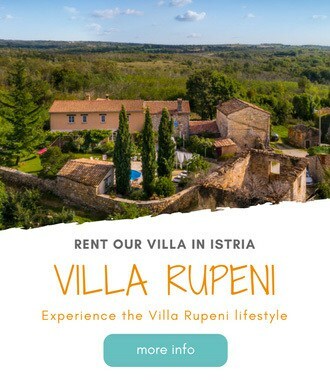 The village is located high up in the hills of the Istrian countryside. It's really remote, and far from any tourist sight. But once there you are rewarded with a piece and quiet, and stunning views over the mountains and the valley below. When I called to make a reservation for a Sunday lunch, the place was already fully booked. But I pushed a bit and got us a table at 3.30 pm. Neither really a lunch, nor dinner time. But we were happy to be accommodated. Tavern is small inside. It can accommodate 40 people. They do have an outdoor terrace for another 40 guests. This terrace is not really used during the winter. However, the terrace offers some of the best views possible. We already made a deal to go back in summer too to enjoy those views. Interior is beautiful, rustic and traditional. Stone walls, large open fireplace, wooden tables. The atmosphere is convivial. And the service is really exceptional. The tavern is family-run, and you feel it right away. The owners are warmhearted people that make you feel at home from the moment you walk in. On arrival we were offered homemade brandy, that we politely refused (but took later on). There is no menu, but instead the waiter recite their daily offer. That day we chose scrambled eggs with black truffles, and a plate of cold cuts. The plate of cold cuts included: homemade sausages, prosciutto, pancetta, and cow cheese. Delicious! You can say by now that we are crazy about truffles. Warm starter included pasta for Vera, and gnocchi for me. Pasta was cheese filled ravioli with black truffles. And my gnocchi came with a rooster stew. Have I already told you that they grow all their produce themselves, and that their animals are farm free. Oh, yeah! My stew was just so succulent. Feeling hungry, right now. For the main course we were offered sausages, pork tenderloin, and roasted rooster. We had some white, table wine with our meal and a bottle of water. We were already feeling pretty much full, and wanted to spare some place for dessert. Sweets are my biggest weakness. And I am not even allowed to eat any sweets. For dessert we chose a sponge cake with chocolate and coco, and a yogurt cake. Both were really tasty. We also gladly accepted their homemade cumin schnapps. Very refreshing, but strong too. The total bill for two of us was 380 kn (approx. 50 euro). Great value for money! We both loved tavern Toncic Zrenj, and we are already planning to go back again. Contacts: Cabarnica 42, Zrenj; t: +385 52 644 146; m: +385 91 2060 512; Open only on weekends. Have you been at the tavern Toncic? Do you like rustic places serving home grown and home made food? Let us know in the comments below. My husband and I visited Toncic in Zrenj in June of 2013. I love to travel and I “live to eat”! Toncic was the highlight, not just of the Summer of 2013, but of my whole life! The owner’s wife waited on us and we just let her tell us what we wanted! This place is popular with the locals! I think the same people show up here every week at the same time. I was the only woman in the restaurant……. It is in the middle of nowhere, but so worth the trip! Lol, Eva! I love them too. can eat them anytime and never get tired. Thanks for stopping by and for your comment.